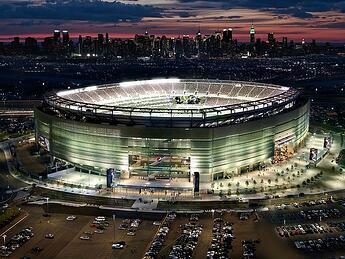 MetLife Stadium, home of the New York Giants and the New York Jets, was completed in 2010. Seating 82,500, the stadium has significant trash challenges. Prior to each football game, fans dispose of about 8.5 tons of garbage during tailgating, and another 8.5 tons inside the stadium during game time. Cleanup after events is not as simple as it looks. Henry Rzemieniewski, MetLife Stadium’s cleaning operations manager, uses large crews to “pick the bowl,” empty trash and recycling bins, and comb the parking lot for trash. This labor-intensive process involves collecting the garbage, and then transporting it into the stadium’s basement for pickup by trash haulers. Patrons of the $1.6 billion facility – particularly NFL season ticket holders – have high expectations for their stadium experience. “They expect it to be functioning in a clean and sustainable way, with efficient trash management and recycling,” says Rzemieniewski. Workers filled bags, waited for a single freight elevator, took the bags to the basement level, and then rode all the way back to the upper decks to collect more. Metlife Stadium has 7 floors. Orwak and its partners offered a solution that involved improved orchestration of crews, as well as compacting and baling on high-volume floors. This enables crews to store trash nearby, so they don’t waste time going up and down to the basement. For bottle recycling, Orwak and its partners provided improved signage, collection bins, sorting, compacting and baling. After a successful pilot project, the stadium installed an Orwak 5031e trash compactor in a dedicated trash room on the facility’s highest-volume floor. The 5031e compacts 15 bags of non-recyclable trash into one, saving valuable space. 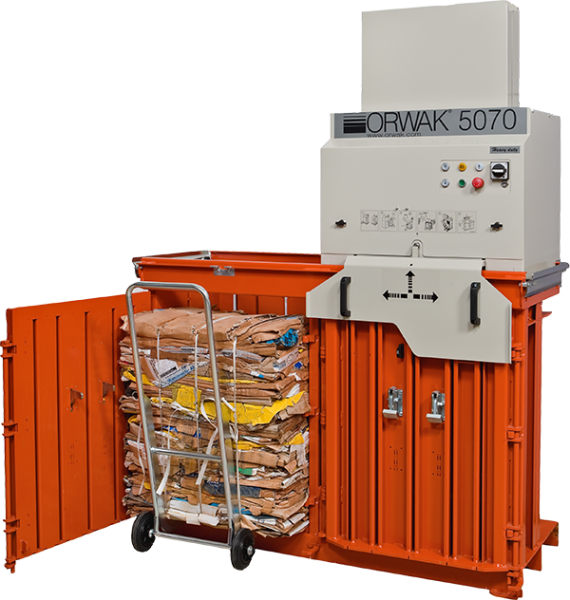 The trash rooms are also used for separating recyclables, which are then compacted and baled in the Orwak 5070 HDC dual-chamber baler. This allows for baled recyclables to be transported to the lower levels in a far more efficient way.